So many people have asked about this, and now another dream has become reality. No matter whether you want to head off on holiday with your own horse to enjoy the wonderful trails that Alsace offers, or if you're looking for B&B accommodation for horse and rider on a longer trail ride.... Together with my neighbours, Ulrike and Horst Hallmann I can offer just that. 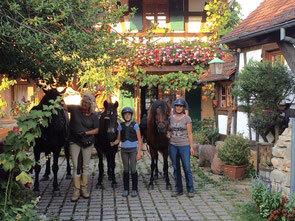 Ulrike and Horst look after the riders, and I make sure the horses are happy. We have space for up to nine horses and riders. If you are interested in finding out more just contact me.